REIKI is a Hands on Healing Technique. As a REIKI Channel your Life Force increases to Higher Frequency which helps in your Personal, Emotional and Spirtual Growth. As a REIKI Channel Level 1 you could send Hands on Healing to your Self and Others through touch for the purpose of Relaxation and Faster Healing. REIKI is a very Simple yet very effective tool and now the Scientific Researches also establish the many benefits of REIKI. REIKI can be embraced by any Age group and for all people from different walks of Life. 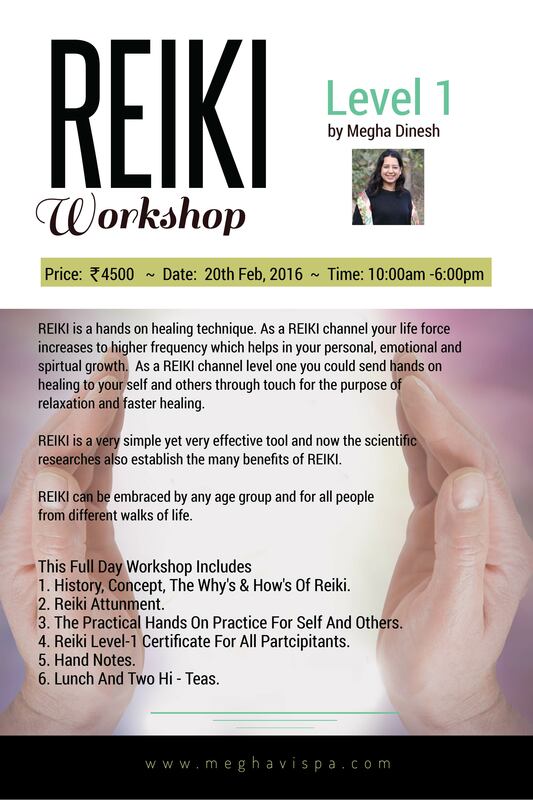 History, Concept, the Why’s & How’s of REIKI. The Practical Hands on Practice for Self and Others. REIKI Level-1 Certificate for all Partcipitants. Lunch and Two Hi – teas.